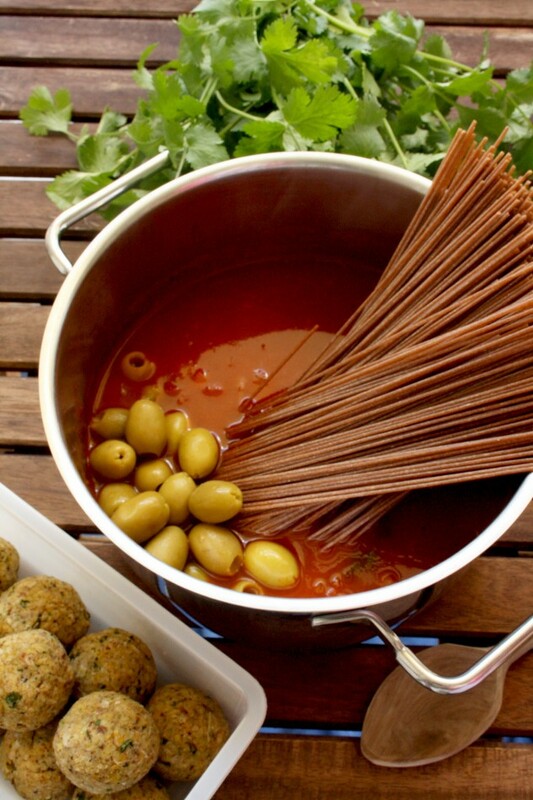 Refreshing and nutty falafel-based vegan meatballs, full of protein and nutrients, served over one-pot whole grain spaghetti with rich marinara sauce. Healthy and quick vegetarian weekday dinner idea! Vegan meatballs sounds crazy and I’m not going to say that they taste like meat because it won’t be true. 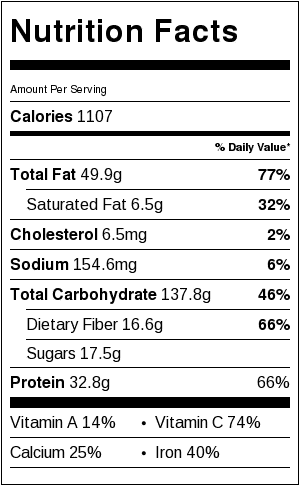 But they taste like falafel, which is also awesome, isn’t it? 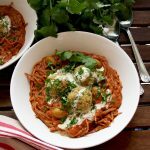 I mean, they are refreshing and nutty, full of protein and nutrients, served over one-pot whole grain spaghetti with rich marinara sauce and drizzled with lemony yoghurt dressing. It’s a perfect light spring comfort food for me. If you’ve been following my blog lately, you probably know that my kitchen is being renovated, so I don’t have an oven for a while. Although I wish the renovations would go faster, I think living without an oven makes you improvise a lot, which is also a good thing. I made a big batch of baked falafel a while ago, I froze some of it and now I can easily use it in my cooking. For the moment, I opt for easy and quick but still healthy food that doesn’t require baking and is preferably one-pot dish. 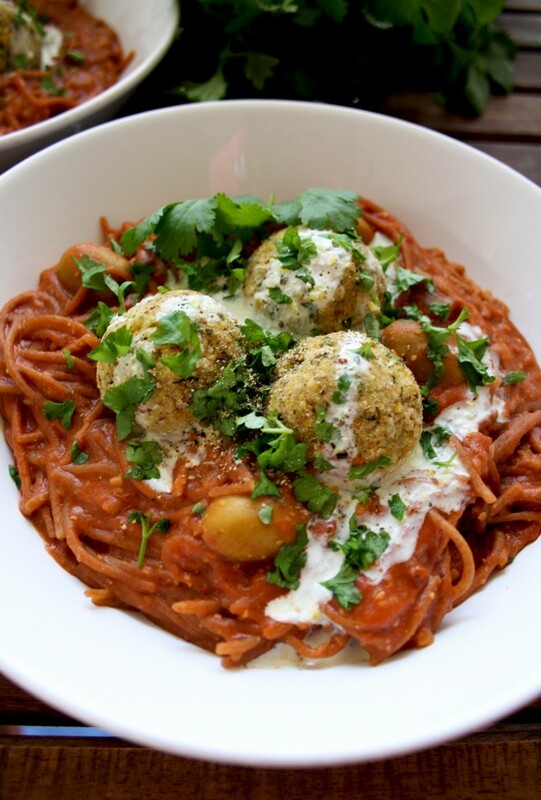 This easy falafel spaghetti and vegan meatballs is just perfect for me. They are delicious, mess-free and healthy and that’s all I need. I already had my baked falafel ready, but if you don’t, it won’t take you long to make it. And I highly recommend you to make a big batch and freeze it because there there is a dozen of other ways to eat this Middle-Eastern street food. Traditional pita-stuffed pockets, savory pies, veggie burgers, pizza, power bowls, vegan hot dogs, stuffed vegetables, wraps, curry, gyros, salads, even Scotch eggs and falafel waffles! In fact, I wrote an article on different ways to enjoy falafel, which I encourage you to check out. Some of the ways are insanely creative and fun to make at home! I can’t wait to get back to “real” cooking. And one of the reasons is that I want to try some of the recipes from a new e-cook book written by my friend Ksenia Prints, who is with the food blog At The Immigrant’s Table. 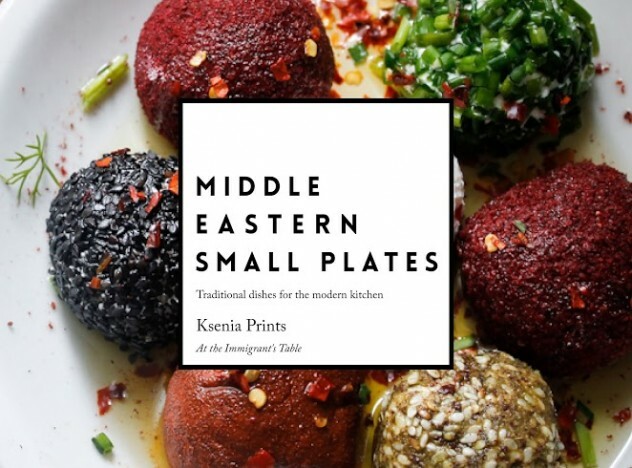 The book is called The Middle Eastern Small Plates and it features vegetarian appetizers and finger food for the best Middle Eastern party you can ever host. It’s a vibrant recipe collection of some of the best Middle Eastern dishes! If you wish to order the book, you will get a 15% discount if you use the promo code #HAPPYKITCHENROCKSLOVE when making a payment. 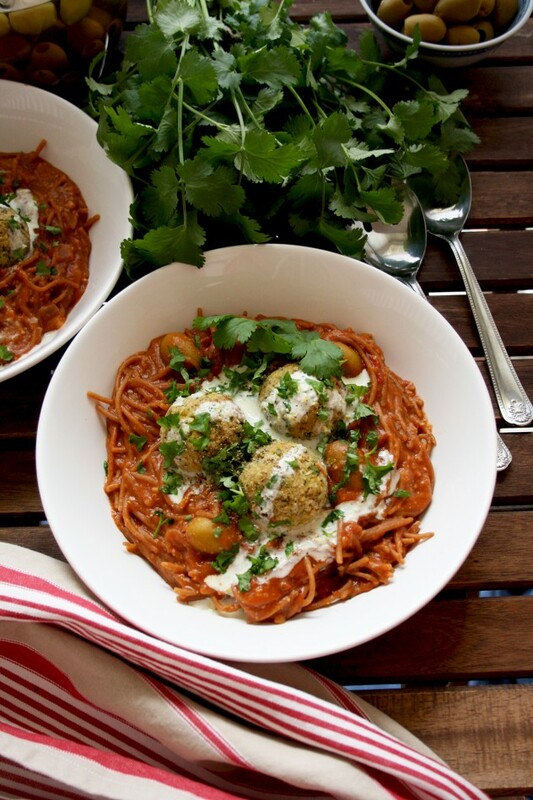 Back to the one-pot spaghetti with falafel meatballs a.k.a. vegan meatballs. I don’t know why I haven’t been making one-pot spaghetti before because it’s a genius method! Just toss spaghetti into a mixture of vegetable broth and marinara sauce, add olives, cook until al dente and you are done. It’s that easy! 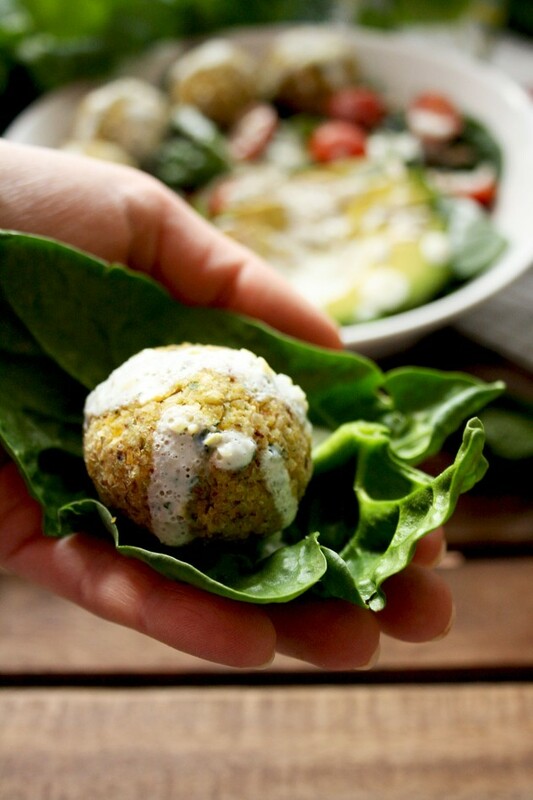 Put the falafel on top, drizzle with 3-ingredient lemon-mint-yoghurt dressing and enjoy a healthy and easy dinner packed with flavor! 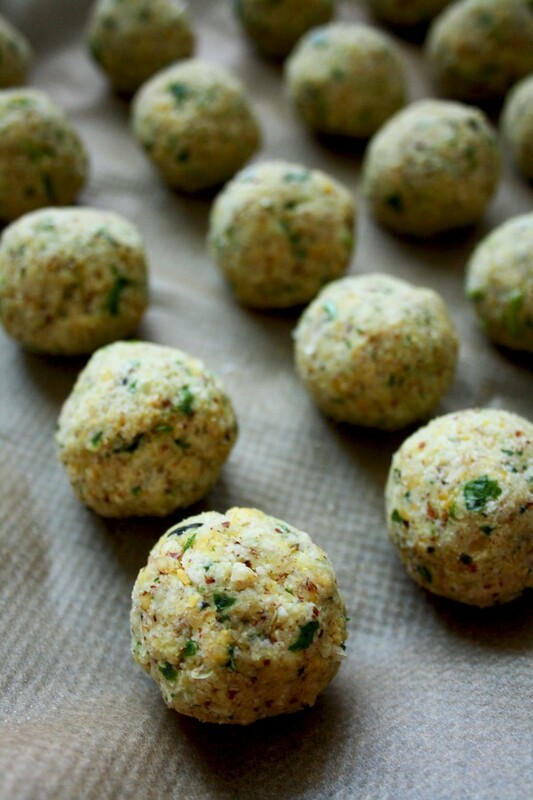 If you have your falafel ready, you only need 15 minutes to put it all together. Check out this recipe and enjoy the Middle Eastern touch on your table! ONE-POT SPAGHETTI: Heat a lug of olive oil in a large pot or skillet over medium-heat. Add minced garlic and sauté for about 1 minute until golden. Add diced tomatoes, tomato paste, a pinch of salt, cilantro and vegetable broth. Bring to a boil. Add olives, spaghetti (broken in half, if needed) and 2 falafel balls (use your hands or a fork to break it up into smaller pieces) and cook for 6-8 minutes, stirring occasionally to avoid clumping. Add more boiling water if needed. Discard the cilantro before serving. DRESSING: For the dressing, combine the yoghurt, juice and zest of 1/2 lemon and mint leaves and pulse in a blender until combined. ASSEMBLE: Divide the spaghetti among 2 bowls, place 3 falafel balls on top of each bowl and drizzle with the yoghurt dressing. Garnish with the chopped cilantro. Enjoy! What is your favorite one-pot vegan pasta dish? Leave a comment below!